The finest in outdoor cooking just got better with high-performance, industry leading heavy-gauge materials and commercial quality craftsmanship in the Blaze Professional. The three commercial quality, cast stainless steel H-burners provide up to 18,000 BTUs each for a total of 54,000 BTUs to provide an effective cooking system. The heavy-duty 12mm hexagon, stainless steel cooking rods helps you achieve extraordinary searing temperatures, maximizes the durability of this grill and provides 615 square inches of main grilling area. Slow-roast delicious meat or fruit using the 10,000 BTU infrared rear burner and included rotisserie kit with waterproof motor for grilling versatility, and when you are done, you can store the rotisserie rod behind the grill on the storage hooks. The removable 201 square inch warming rack is an ideal place to keep bread and other food heated while you grill. Push and turn flame-thrower primary ignition and backup flash tube secondary ignitions for each burner ensure a steady, reliable flame with every start. The stainless steel heat zone separators allow for different cooking zones across the grilling surface and helps eliminate wasting heat and fuel. This adds to your grilling experience, creating separate zones that can be used for different styles of cooking. The extra-thick flame stabilizing grids minimize flare-ups and the full-width, roll-out drip tray and removable baffles make cleaning a breeze. Interior grill lights along with the signature red LED knob illumination system help you grill and entertain at night. The double-lined, 304 stainless steel grill hood is designed to protect the outer layer from heat discoloration and retain heat. Please note that a 110V power source is required. This product is ETL certified with an ANSI Z21.58-2018/CSA 1.6 rating. I purchased this grill one year ago and it looks just as good as the day I opened the box. This grill is well built and feels heavy and sturdy, built to last. I keep my grill covered all the time when not in use. It has its normal wear and tear from usage, I grill at least once a week. I couldn't be happier with my purchase. I realize it is expensive but I believe it is well worth it. This grill is very well constructed. The burners and grates are constructed of much heavier materials than any other grill I have owned. That's both a strength and a weakness of the design. 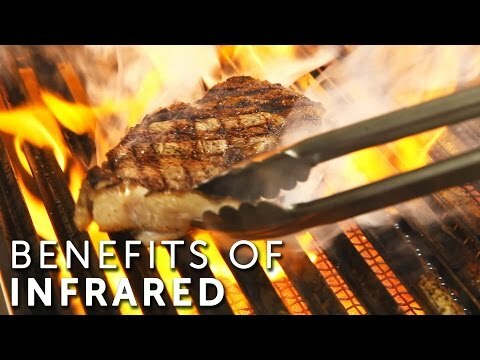 The grill cooks hotter than you are probably used to which is great for steaks, burgers and vegetables, but finding the right heat balance is difficult for cooking things on low heat for a long period of time. I am having to adjust the heat settings much more frequently than I like. I am learning how to use the rear infrared burner, each time seems to get a bit better. I liked the shopping experience with BBQ guys! First class workmanship. A wonderful bar-b-q. I shopped around for months for the right grill b/c im not going to spend a couple of grand without doing my homework!! 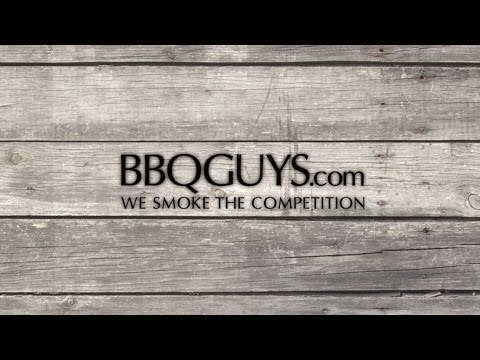 Found Shoppers Choice / BBQGuys and called and got ALL the info I could. They seemed to love the blaze Pro because its so well made and affordable. They were so right. Very easy to set up and maintain. Burns hot, sears perfect and even smokes large meats well. If you want a grill that will be around in 15 years...buy the Blaze pro. No regrets! So I have had my professional 3 burger grill for about 6 weeks now. It has been great. Easy to put together and install. Customer service took care of any questions and the grilling has been second to none. Of course, as soon I used it it was no longer sparkling brand new but that is fine. The grill gets super hot and the temperature is easy to control. Best buy around. You won't regret it. I have had a few weber and other grills over the years and this grill is by far the best grill. Cooks evenly and fast and flame ups are controlled to prevent burning. Rotisserie cooks to perfection. I have used grill to cook, steak, chicken, burgers, and fish all delicious. I purchased and installed this grill in Nov 2014. Overall, I love it and use it several times per week year 'round. I love the heavy duty stainless grill grates. The burners are quality also. I would definitely recommend this grill as a middle to upper skill level bbq'er. On the down side, I don't care for the rotisserie. I've cooked a few whole chickens and they turned out good but took forever for a smallish bird. It would be nice if Blaze made a better cover for the thing. They have ONE product that only lasts about a year. The vinyl cracks and it blows off in the wind. Just received it and cooked a porterhouse to break it in. Was able to get the same grill marks that you see on the video. Love the grill. Only suggestions for improvement are to replace the useless color "low-medium -high" hood thermometer with a degree thermometer like fire magic and use 304 stainless on the grill cart. Just being picky but for the price there doesn't seem to be a better grill on the market. Just have to figure out what to cook tomorrow! Top quality materials from the inside out, nice and heavy and cooks evenly. The lights are very cool, both the inside light and the red LED's that light up the front controls. I often turn the LED's on if I'm on the patio at night and not grilling. Here's what I don't like: 1. Burners are often difficult to light- I would have preferred the electronic igniters, as I think that would have helped the situation. 2. Rain water enters the seam where the front of the lid closes, which fills the drip pan with water. When grilling, grease then goes down, mixes with the water, and overflows all over my bluestone patio (not good!). I called Blaze and they were very dismissive of my concerns. I got some high temp clear silicone and filled the seam and problem is corrected. Overall, I am very pleased with this grill. 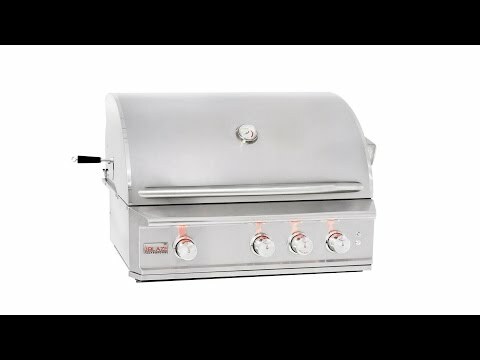 How hot will the grill get with the standard pro burners? 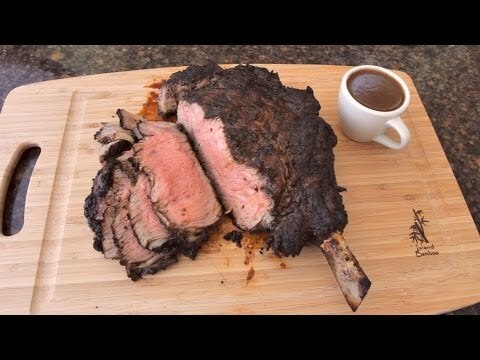 Is it hot enough to really sear without over cooking a steak? How hot will the pizza stone get on the pro burners- is it over 800F that you need for a pizza oven? Hi, Ron. The temperature range can vary depending on outside temperatures and how much you're cooking at one time, but this grill will get hot enough to sear steak without overcooking or bake pizza. Just preheat the grill at high for the steak or medium for the pizza, and you'll be good to go. what rotisserie kit goes with this grill? The Blaze Pro comes with the rotisserie kit. Blaze makes a specific Professional Rotisserie Kit and it comes with the grill. A distance of 5 inches will be needed behind the grill for the lid to open and close. Also keep in mind that the manufacturer specifies that more clearance is required if the nearest material is combustible, like wood. 30 13/16 X 19 15/16" 31 1/2 X 19 1/2" 27 X 20" 33 3/8 X 20 1/2"
32 1/4" 42" 28" 36 1/4"
23 5/8" 24 5/16" 23" 24 1/2"
10 1/2" 36" 9 1/2" 10"